Cooking amaranth grain yields a nutritious, filling meal component for any vegetarian or vegan. Amaranth is a natural whole grain that is often grown organically and can be included as part of a healthy vegetarian diet. Its seeds are slightly smaller than quinoa seeds and are prepared in a similar way. 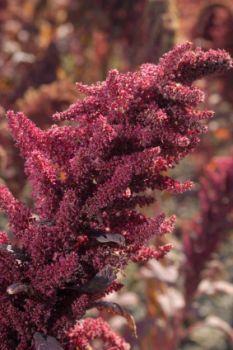 Amaranth has a pleasant, subtle, nutty flavor and is high in calcium, fiber, and proteins with essential amino acids. You can try cooking amaranth grain on the stovetop as you might cook rice or with a pressure cooker. 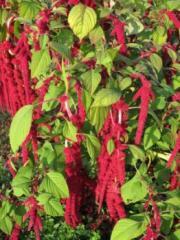 Rinse the dry amaranth seeds once or twice with cold, clear water. Place the amaranth in a clean pot, and add water. Use a ratio of 2.5 to 1 for water and amaranth. For example, if you would like to cook 1 cup of dry amaranth seeds, add 2 1/2 cups of water to the pot. You can also add a sprinkle of salt if you'd like. Set the pot on high heat, and wait until it begins to boil. As soon as it does, reduce the heat to low and cover the pot. The resulting steam will cook the amaranth slowly. Let the amaranth cook on low heat for about 20 minutes. If steam is no longer coming out of the pot and the grain is no longer making a simmering noise, it is done. Turn off the heat and let the amaranth sit with the pot cover on for five minutes. Lift the lid off the pot and stick a fork or knife inside. If the amaranth is fluffy and not too moist, it's done cooking. Rinse the amaranth as you would if you were cooking it on the stovetop. Prepare your pressure cooker with twice the amount of water as amaranth. You can also add oil, salt, and butter. Turn the pressure cooker on high and cook the amaranth for about 6 minutes, until it's fluffy and thickened. Amaranth is a versatile grain that can be used as part of any vegetarian meal. For breakfast, try serving a hot amaranth cereal instead of oatmeal or cream of wheat. Spoon 1 cup of hot cooked amaranth into a bowl and combine with chopped almonds, honey, ground flax seed, and fresh berries, apple pieces and cinnamon, or banana slices. Top with a touch of cream or milk. Include cold cooked amaranth as part of a lunchtime salad. Create a tabbouleh-like dish with amaranth in place of bulgur by combining 1/2 cup of amaranth with lemon juice, chopped fresh herbs, fresh chopped tomato, fresh chopped avocado, salt, and pepper. Create an amaranth taco. Sprinkle about 1 ounce of shredded cheddar or Swiss cheese on a whole-wheat tortilla, then top with 1/2 cup of warm cooked amaranth. Garnish with fresh tomato, avocado, cilantro, chili powder, cumin, salt, and pepper. For dinner, try serving a vegetable stir fry with hot cooked amaranth instead of white rice. Season the stir fry with tamari or soy sauce, ginger, garlic, and orange or lemon zest. If you'd like, you can also season the amaranth with turmeric, chili powder, salt, pepper, and other spices or mix in fragrant raisins, peas, pine nuts, or other garnishes. Prepare an amaranth-based dish by mixing hot cooked amaranth with roasted or sautéed vegetables, onions, chickpeas, walnuts or pine nuts, high-quality olive oil, and fresh basil.